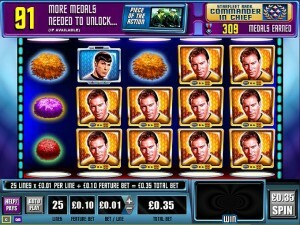 Trap a Tribble is a WMS slot machine, which, as you can tell by its name, is part of a series of Star Trek games. It’s the fourth episode that WMS has created for the series, and you can advance from one to the next by collecting medals and reaching a higher rank. Each slot has its own story, and just like the third episode, the fourth one is themed around the famous story with the tribbles that threatened to take over Enterprise by breeding at an astonishing rate. 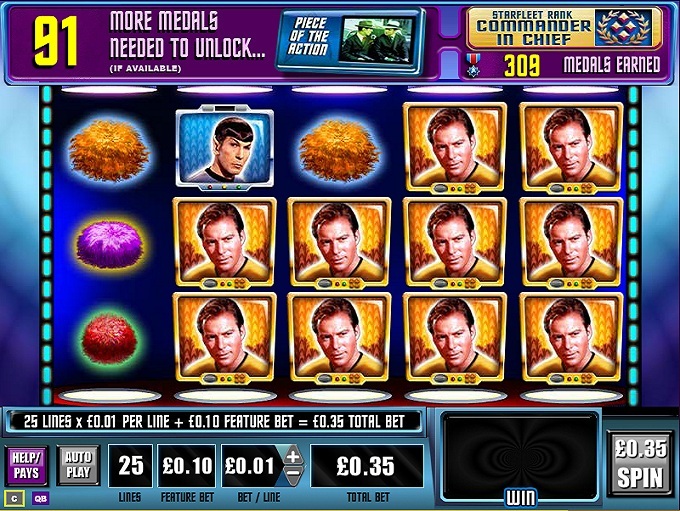 You’re using 25 paylines at all times in Trap a Tribble, you get the Win Warp, bonus games, scatters and wilds, plus a chance to win up to $5,000. The slot’s major features are the wild, the scatter and the bonus game which the latter will trigger. An additional bonus feature is present and triggered at random. 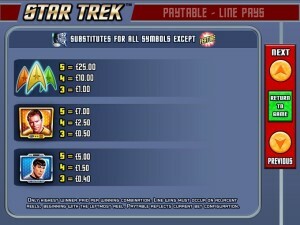 The logo of Star Trek serves in this game as the wild feature which you can rely on to get new wins from time to time, if your luck helps out and puts it in the position where it’s needed. The wild substitutes if the rest of the requirements for the combo are already met. The Game Logo will provide only the missing ingredient, and only if it landed in the right location. Wilds can’t replace scatter symbols. You will notice another feature with a big role in this game, a Feature Logo which is the scatter of the slot. Have four or five symbols on the reels, and you get paid 5x or 50x the bet. When three or more are present, you get the bonus game. The slot’s bonus game starts up when you have sufficient Feature Logos present. You get 8 free spins from the feature. 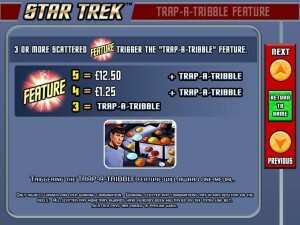 The symbols with Trap a Tribble can bring you cash prizes when they make appearances. They are also collected and you can use 3 to 15 of these symbols to get multipliers of 2x to 10x for the wins. A bonus is also the presence of symbols called Extra Free Spins. Having three to five of these will bring you 8 to 20 extra rounds for free. This particular feature is the one that you pay extra for, the additional 10 coins which are part of the bets. When triggered, it will give you one of four potential bonuses. One of them gives you Kirk wild symbols, turning regular Kirks into them with the help of an Alien Woman. Another one places up to two wild reels on the screen for the round. The third one can give you up to 10x win multipliers. The last possible feature places multiple high paying symbols of the same type on the screen. The game needs a fixed number of 35 coins, 25 being for the lines and 10 for the Win Warp feature. You decide only on the value of those coins, the range going from $0.01 to $2, and allowing for up to $70 bets. You’re not getting rich with the slot’s 2,500 coins, the value of the jackpot reaching $5,000 at most in the base game. The features can improve it significantly though, especially since Win Warp can apply up to 10x multipliers. The game’s design looks appropriate for a slot themed around a 70s TV show. It shouldn’t look modern, but despite the retro vibe it needs to look good, and this slot manages to do that. 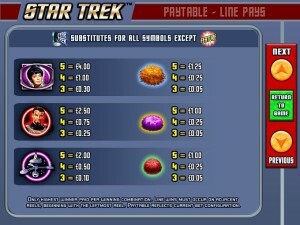 It features symbols with the main actors from the series, with various types of tribbles and things like starbases or communication badges. 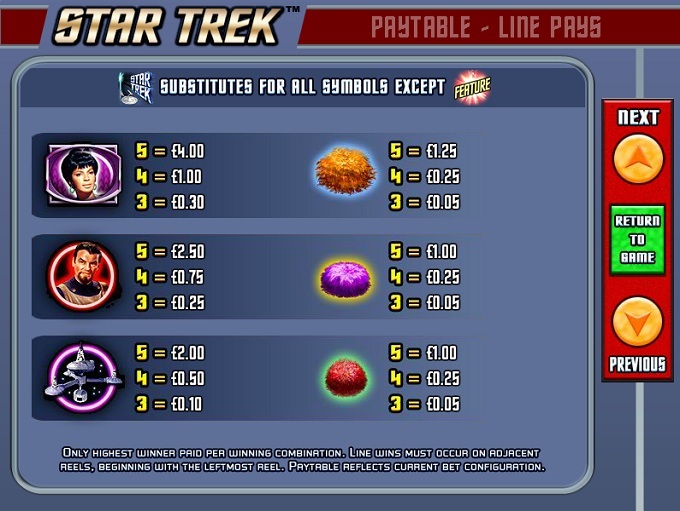 Symbols: Game Logo (wild), Feature Logo (scatter, 50x total wager), Colored Badges (2,500 coins), Kirk (700 coins), Spock (500 coins), Uhura (400 coins), Officer (250 coins), Starbase (200 coins), Orange Tribble (125 coins), Pink Tribble (100 coins) and Red Tribble (100 coins). 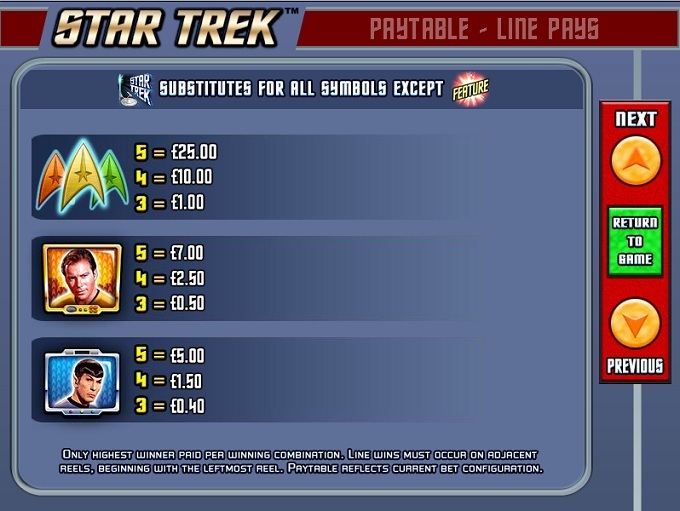 The last title from this Star Trek series, it offers one last mission to experience when you get the bonus game triggered. If you’re a fan of the Star Trek universe, you shouldn’t miss out on this series. 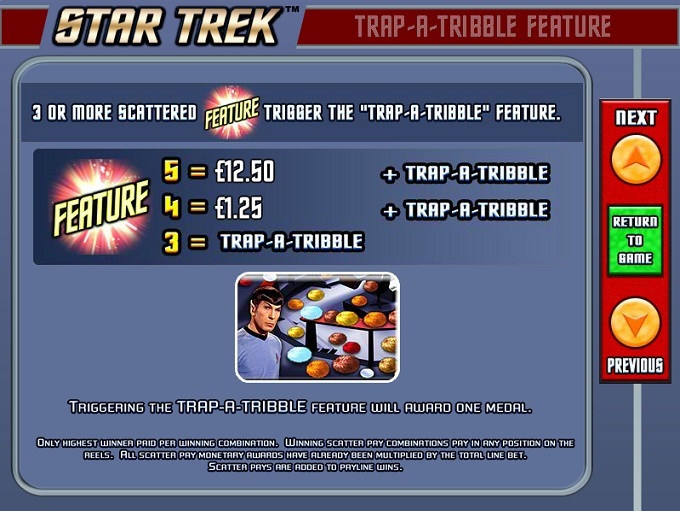 The Star Trek Episode 4 – Trap A Tribble slot machine is offered through the WMS platform, so if you want to play it for real or just to practice, look out for casinos that use it.